If you are a Mom who enjoys decadence (like me), you may want to leave a picture of this hanging around the kitchen. With Mother’s Day approaching, there might be some little hands who might want to put this together for you. It’s the perfect dessert for the impatient and the baking challenged, as it takes only minutes to toast and slather these waffles with hazelnut spread. Sliced strawberries would also be a perfect replacement for the berries. 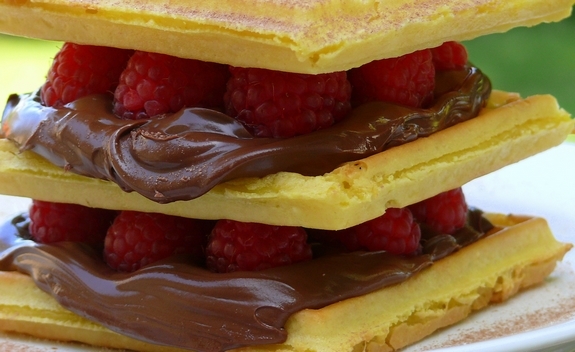 So forget about calories for one day and enjoy this over-the-top dessert. Toast waffles until crisp. 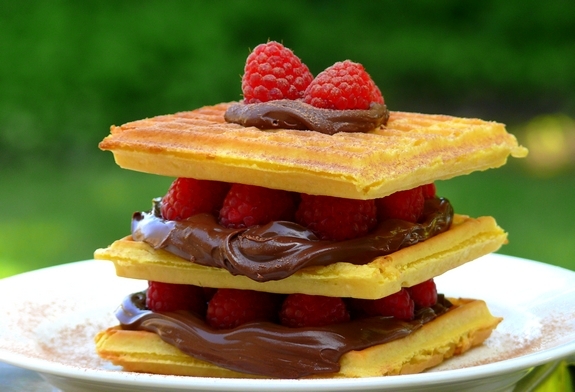 Stack the waffles with Nutella and berries between each layer. Top with more berries and dust with cocoa powder. adorable! and any excuse to get nutella in my gullet is a good one. So easy and perfect! I love it! Oh my! this is heaven on a plate! I hope you get this, Cathy!! Looks wonderful! Happy Mothers day! Thank you! Now I know what to make for breakfast tomorrow!